September was a huge month for SJ Games, with a new Munchkin starter set, an expansion for a great game, and some highly requested accessories! We have a lot to cover, so let's get into this month's new releases. Don't go into the woods alone. That's where fairy-tale creatures live! What, that doesn't scare you? You must not know Grimm Tidings. These ain't bedtime stories. We're talking dark. Murder rooms, cannibalism, singing sausages – the worst that your mind can produce has been included. But you can fight the twisted tales with new classes like the Tailor, or being Eldest, Youngest, or even a Princess (making this a great set to mix with Munchkin Princesses – just saying). John Kovalic brings the world of Grimm's Fairy Tales to life, and makes it funnier than ever. You can find Munchkin Grimm Tidings exclusively at Walgreens. Mystics, Martial Artists, and Marvel, oh my! 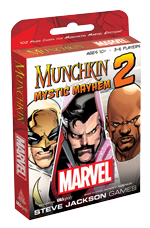 The expansion for the hit game Munchkin: Marvel Edition is here! Featuring heroes of the mystical persuasion, Mystic Mayhem lets you fight alongside Doctor Strange and Iron Fist to defeat epic villains like Dormammu and Baron Mordo in all-new settings. Dungeon cards are making their appearance, with classic Marvel locations like The Raft, Asgard, and The Dark Dimension. These new cards give each super battle a unique feel and personality, just like the comics they come from! One of the accessories most requested by fans is Munchkin Sleeves. Well, wish no more! These Munchkin Door And Treasure Card Sleeves are perfectly sized for Munchkin cards. Featuring new art from Ian McGinty, your cards can finally be safe from scuffs, spills, and greasy fingers. For players who have a lot of sets but aren't keen to mix them because of different card backs, this is a great solution! 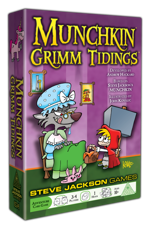 Now you can play your Munchkin Grimm Legends Oz set with no mixing problems. Protection and play value! Be sure to ask your retailer about our Munchkin sleeves promotion, and get exclusive promos only available through this offer. We wouldn't stop with just Doors and Treasures – you need to protect those oversized Dungeon cards, too! Explore the high seas, and don't panic! 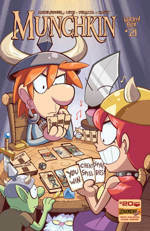 This month's Munchkin comic features a crossover Munchkin Legends and Booty where Spyke and Flower take to the seas, on the hunt for Atlantis and loot! Mostly loot. 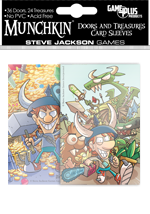 It also features a story based on Munchkin Panic from Fireside Games, written and illustrated by Len Peralta (Star Munchkin Guest Artist Edition). You can also get the inside scoop in our interview with game creator Anne-Marie De Witt. Look for the promotional bookmark code and a special discount code for Munchkin Panic at the back! Check out this Daily Illuminator article for a preview of the awesome art and stories. Feel the magic – become an Incanter! 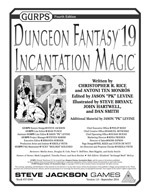 We're in a Dungeon Fantasy Roleplaying Game frenzy, thanks to the Kickstarter, so we present a classic GURPS Dungeon Fantasy PDF as well! This new Warehouse 23 download adds another layer of magic to your campaigns . . . plus gives you another supplement to work into later Dungeon Fantasy RPG content.